Stuart’s first ever figure and a bonus edition Sheldon with his equation variant T-shirt. Figures have 5 points of articulation and include a Comic Book store fold-out diorama packaging. Each limited edition 2 figure set is numbered and an Entertainment Earth Convention Exclusive! Entertainment Earth Convention Exclusive! 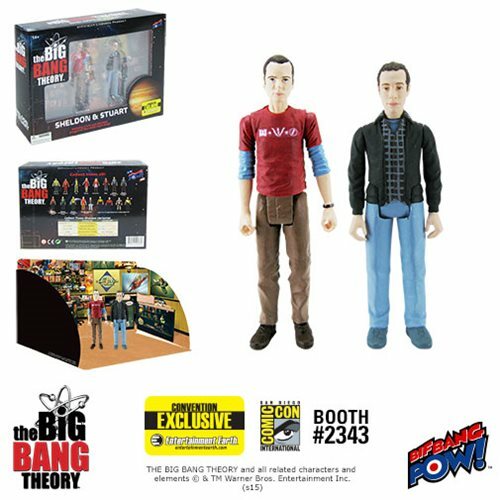 This The Big Bang Theory special edition 3 3/4-inch scale 2 figure set is made exclusively by Bif Bang Pow! for Entertainment Earth as a convention exclusive! In his first ever action figure, the former comic book owner is sporting his sweater jacket and button down plaid shirt combo. It’s all tied nicely together with his blue jeans and not-so matching blue shoes. His theoretical physicist pal is dressed in a red alternate mathematical equation T-shirt and rounds out the look with tan pants and brown shoes. Their apparel is inspired by outfits worn by both characters from actual episodes of the series! Both figures feature 5 points of articulation at the neck, shoulders and hips. As an added bonus, the individually numbered packaging includes a fold-out diorama similar to Stuart’s comic book shop (pre getting burnt to a crisp). This 2 figure set is a limited edition of 2,400 sets Entertainment Earth convention exclusive! It’s enough to make you exclaim, BAZINGA!™ Ages 14 and up. Dr. Sheldon Cooper is smarter than you – and he’s not afraid to say so. A theoretical physicist possessing a master's degree, two Ph.D.’s, and an IQ of 187, Sheldon is originally from East Texas, where he was a child prodigy, starting college at the age of 11. He has zero interest in romance, as his only real love is science (although his “girlfriend” Amy is constantly finding loopholes in their “Relationship Agreement” to disprove this theorem). Stuart Bloom is a graduate of Rhode Island School of Design who turned his passion into a business when he opened a comic book store called The Comic Center of Pasadena. Unfortunately, the store has never been much of a success. Forced to live in the back room, his existence was extremely lonely – except for infrequent visits from stray cats. While not handy with the ladies, Stuart has managed to have one uncomfortable date with Penny and half an uncomfortable date with Amy. Superpowers: Artistic ability, hot plate-cooking ninja, ghost-like paleness. Weaknesses: Bone density of an 80-year-old man; paralyzing shyness around any woman who gives him attention, ghost-like paleness.